How can literature be instrumental in creating community? How can online media facilitate relationships through literature? How can an independent publishing house promote self-determination among its authors and dialogue between authors and fans? These are some of the questions driving our efforts at WildBlue Press. The eZine is one of our modes for exploring these questions. It is a work-in-progress, but we are already beginning to cover some interesting ground. Readers who subscribe for our free membership will receive the publication two times per month, granting them access to exclusive content from authors and experts in our expanding genres, as well as advanced notice of contests and giveaways. In the near future our eZine and website will be undergoing some changes to provide more multimedia content as well as a platform for members to interact with each other and WildBlue authors. Don’t forget to subscribe if you haven’t already! Author spotlight goes live! We will be featuring an Author Spotlight video series that lets readers hear from the people behind the books in their own voices. Aren’t you a little bit curious about what Steve Jackson’s desk looks like? Or what is in Kevin Sullivan’s personal library? Or how Caitlin Rother puts her teaching skills to use when she describes the writing process? 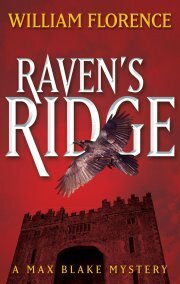 Last month we announced that we will soon be releasing original titles by John Robinson writing as Cameron Bane. 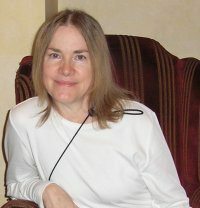 This month we are pleased to introduce another new face to our talented roster: New York Times best seller Debbi Mack will be releasing her back-list of Sam McRae mystery books. 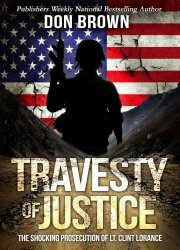 The Sam McRae series follows a lawyer Sam, who is “a tough, but likeable, champion of the underdog. Sam seeks justice for her clients, no matter what. 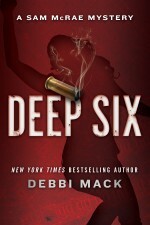 Too often, her choices lead her into situations where she must solve the crime in order to survive and help her clients.” (from Debbi Mack’s site). Debbi brings finely tuned research skills to her work with degrees in journalism and library sciences. If that weren’t enough, Debbi also has a law degree and quit practicing to become an author. We look forward to sharing her work with you! THE OBITUARY by Ron Franscell will be released May 15th. Be one of the first 15 ON 5/15 to send in your receipt and win! 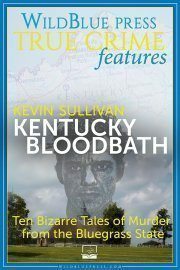 KENTUCKY BLOODBATH by Kevin Sullivan will be released in June. Look for the release day giveaway coming soon! VAMPIRE: The Richard Chase Murders by Kevin Sullivan in print now. 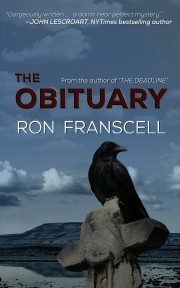 This month’s featured author is Ron Franscell, author of upcoming release, THE OBITUARY, a “thoroughly modern thriller” that finds a forensic anthropologist and a small town newspaper man wavering between past and present as they unravel a dark mystery. 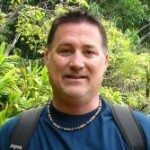 Ron has a hefty list of books a publications to his name; find the titles and links here. And coming soon: Nightmare at Noon and Morgue: A Life in Death. 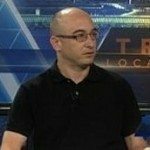 Ron is a life-long journalist who has had numerous articles, book reviews and essays printed in Washington Post, Chicago Sun-Times, San Francisco Chronicle, Denver Post, San Jose Mercury-News, St. Louis Post-Dispatch, Milwaukee Journal-Sentinel and others. 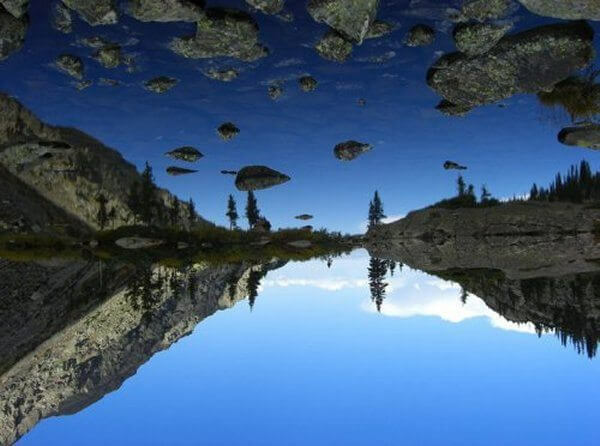 “My fiction has benefited from the authenticity of my newspaper writing, and my nonfiction has benefited from my development of a more distinct voice and confidence in long fiction. They are blended most inextricably in narrative nonfiction like THE DARKEST NIGHT, where I tell a true story with some of the tools in a novelist’s toolbox, such as foreshadowing, dramatic pacing, dialogue, and a more literary flourish. True stories have pot-holes. You must fill them in with more asphalt or drive around them. It’s stupid to patch them with crap and call it asphalt. The real power of a true story is in its authenticity, so there might be power in its flaws. For more of Ron’s kernels of writing wisdom see his blog post on research! WildBlue readers score free goodies on the regular! April’s winners will receive signed paperbacks, ebooks and audiobooks from their favorite WildBlue authors! Author Ron Franscell’s thriller, THE OBITUARY, goes on sale May 15. 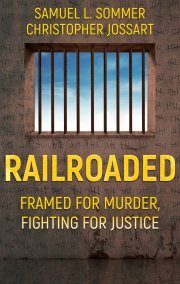 The first 15 people to buy the book ON May 15 and email the Amazon receipt to [email protected] will receive a FREE ‪audiobook‬ from the WildBlue Press collection. 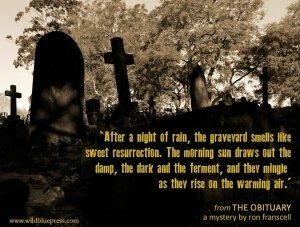 THE OBITUARY, the thrill-packed mystery sequel to THE DEADLINE by Ron Franscell will be released on May 15. Catch up on the adventures of Jefferson Morgan first by reading THE DEADLINE. 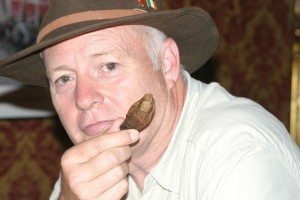 Steve will set a date in the coming weeks for a live discussion about NO STONE UNTURNED, the true story of the world’s premier forensic team NecroSearch International. 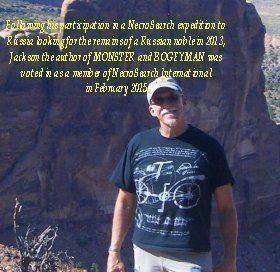 In addition to discussing NO STONE UNTURNED, Steve will answer questions regarding his role as an official member of the NecroSearch team. John Ferak was on True Crime Uncensored and talked about DIXIE’S LAST STAND with Burl Barer. Find the link here! 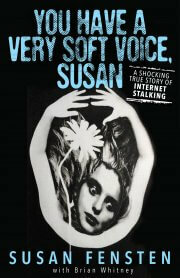 Bradley Nickell gave an interview for Darkness Radio’s True Crime Tuesday. You can find the link here! 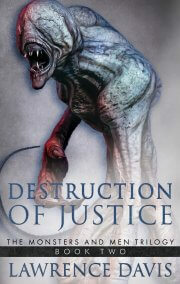 WildBlue Press Author Series on Shattered Lives Radio with Donna “Lady Justice” Gore. 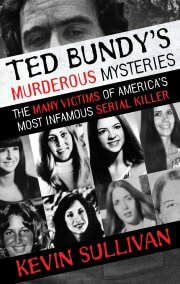 Most serial killer stories are laced with elements of the bizarre. But the chilling and unresolved tale of Belle Gunness, a Norwegian immigrant who lived in La Porte Indiana at the turn of the 19th century, is so strange and so macabre that it almost seems like a composite of multiple murder mysteries. Among the most eerie details of the story of Indiana’s so called “murder farm” is that Belle Gunness was never apprehended and likely faked her own death to continue her brutal ways under another name. Before she became the mistress of murder farm, Belle was a Norwegian transplant to Chicago with expensive tastes. It appears that she may have started running insurance scams beginning in 1896 when the candy shop that she owned with her first husband, Mads Sorenson, burned down followed by two of her houses. Two of her infant children died of ambiguous ailments involving stomach pain and nausea shortly after; Belle collected life insurance on both children. Belle’s career as a “black widow” began in 1900 with the death of Mads Sorenson–on the very same day his two life insurance policies would overlap. One of the doctors who saw to Mads on his deathbed suspected poisoning to be the cause. But a family doctor argued that it was Mads’ heart condition that finally did him in and Belle was free to recruit her next victims. With the money from her various insurance settlements, Belle bought a farm in La Porte, Indiana, which would become the final resting place for most of her victims. She married a man named Peter Gunness in the Spring of 1902. Within less than a year, Peter and his infant daughter were dead. Peter died of blunt trauma to the head, which Belle insisted was an accident involving a meat grinder. The authorities seemed suspicious but for some reason were swayed enough by Belle’s mourning widow act to drop the case against her. Belle wasted no time in finding a new male companion. She would post compelling advertisements in the local Norwegian-language newspaper soliciting men to come to her farm “prepared to stay forever”. Once they began to correspond with her, many of these men seemed driven beyond reason to liquidate their assets, cut ties and move to the farm. Belle would prime them every step of the way, telling them to arrive with all of their worldly wealth, promising love and a place to call home. It is not known exactly how many men fell in to her trap; Belle’s list of suspected victims ranges from 15-40 by some counts. Other townspeople noticed a consistent influx of male visitors who were not ever seen to leave. In 1906 a young girl who had been left in the care of Belle Gunness went missing. Around the same time buzz about Belle’s mysterious male visitors began to crescendo. murder when it came to light that Belle had expressed concern for her own well being to her lawyer. She told the lawyer just the day before the fire that Ray Lamphere was unstable and threatening. Lamphere was found guilty of arson, but not murder as investigations proved inconclusive. Some said the body of the headless woman was too small to be Belle. A strangely unscathed set of dentures and crowns that were identified as Belle’s were found at the crime scene, but without any evidence of having been through a fire. With the skull missing entirely, it is thought that the dental evidence was planted. A family member of one of Belle’s entrapped suitors came to the farm when news of the fire broke. He knew his brother had been involved with Belle before he disappeared. He told police that he suspected foul play and prompted an extensive search of the farm which revealed at least twelve other bodies including the body of the young girl who had gone missing while in Belle’s care. The entire community was left in utter shock at the news of the “murder farm.” Suddenly, Belle Gunness sightings began to pop up across the region. The next year, Ray Lamphere died of natural causes. On his deathbed he admitted to helping Belle plant the bodies of her children and an unknown woman in her house, set fire to it and flee La Porte. In 1931 a woman matching Belle’s description was arraigned on charges of poisoning an elderly man and taking his money. Her name was Esther Carlson and there were no records of her life before 1908. Esther Carlson died before ever serving a day in prison. Because forensic technology at the time of the fire at murder farm was so rudimentary, there are still many questions about the remains recovered as well as Belle Gunness’ ultimate end. 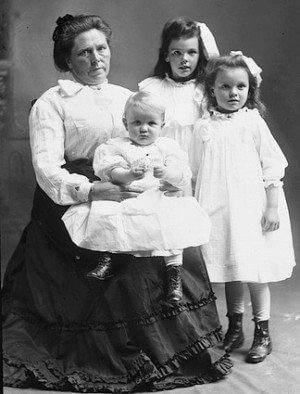 There is no survivng DNA sample known to belong to Belle Gunness that is intact enough to compare to the remains which fill her grave. Forensic anthropologists from the University of Indianapolis have even unearthed those remains in an effort to shed more light on the past, but it appears that the scope of the horrors inflicted by Belle Gunness will remain known only to the villain herself and the people who were unfortunate enough to get close to her.